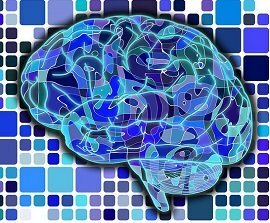 Want your brain to function at its best and avoid memory loss? Achieve and maintain a healthy body weight for the rest of your life. According to studies, overeating may DOUBLE your risk of memory loss, cause your brain to shrink, and lower your overall cognitive ability! To get in shape isn't easy, but it could protect your mental health. Being overweight or obese is a risk factor for learning impairment, dementia, and memory decline. A "healthy body weight" doesn't mean you have to be a body builder or a fitness model. The goal is simpler: Don't be too thin or too fat. The Body Mass Index (BMI) scale is a useful measure of fatness. Below I explain how to use the BMI to understand how overweight you might be so you can set a weight loss goal. Stay in the healthy BMI weight range, and your brain may function better. You'll also be at less risk for serious conditions like dementia, heart disease, joint problems, and diabetes. I was overweight in the past (see photos at right), but I took action and got in shape. I'm 5ft, 10in tall. 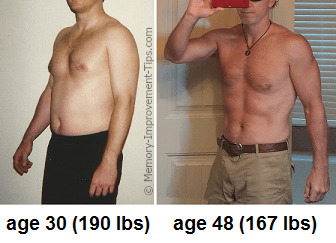 At age 30, I weighed 190lbs. For my height, that put me squarely in the "Overweight" range of the BMI scale. Today at age 48, I weigh 167 lbs, or 23lbs less than my previous weight. Now I'm in the "Normal" BMI range, and I plan on staying there. I didn't start out in great shape. But I've learned tips and tricks on how to lose weight slowly and steadily to achieve a healthier body weight. I'll share my weight loss advice and tips with you on this website. Regardless of current weight or fitness level, it's possible for almost anyone to lose fat and get in better shape. Healthy eating, exercise, and consistent goal setting are the foundations for making the transition to a healthier body weight. It's well-known that high body fat is a risk factor for diabetes, high blood pressure, cancer, and other diseases. For example, here's a scary fact: excess body weight contributes to 20% of all cancer-related deaths, according to the American Cancer Society. To enjoy better brain function and overall health, take steps to get your weight closer to the Normal range on the BMI scale. Reaching a healthy body weight (or moving in that direction) can improve your memory now, and it may decrease your chances of memory loss and dementia later. Don't wait for symptoms of dementia and other health problems to arise before taking action. Cognitive problems can occur even without the presence of chronic disease like hypertension or diabetes. Being overweight, in itself, has the potential to impair brain function and even shrink the size of your brain! By losing weight and exercising more, they [obese, sedentary people] would be much more protected against neurodegenerative diseases. It's a message that needs to get out to the public. If you are carrying around too much weight and are experiencing memory problems, don't despair. Studies indicate that negative effects may be partially reversed by losing the weight and adopting a healthy lifestyle. Next let's look at specific ways a high body fat percentage affects the brain. When you see this list, I think you may be extra-motivated to achieve a healthy body weight. Some of these problems are linked to chronic diseases such as hypertension and diabetes that affect the brain. However, even overweight individuals without chronic diseases may be at risk of cognitive problems. During this study of 1,200 seniors between 70 and 89 years old, titled "Overeating May Double Risk of Memory Loss," researchers with the Mayo Clinic uncovered a dose-dependent, positive link between memory loss and total calories consumed daily. "The higher the amount of calories consumed each day, the higher the risk of MCI," according to Dr. Yonas Geda, an author in the study. The Mayo Clinic study took into account each person's history of stroke, diabetes, education, and other factors that affect memory loss. Total calorie count was strongly linked to risk of cognitive impairment regardless of other factors in their medical history. Rather than waiting until you begin to experience cognitive problems or other health issues associated with your weight, why not start a healthy weight-loss program today? Now let's turn to the Body Mass Index (BMI), a scale of measuring fatness that I mentioned above. The BMI is a quick and easy way to find your general starting point before you consider a program of weight loss. You can use any of the BMI calculators on the web to quickly generate your estimated BMI score. The BMI score does have limitations. It isn't accurate for body builders, certain athletes, fitness models, professional dancers, or others who have a low body fat, high muscle mass ratio. These people may in fact have a healthy body weight not reflected by their calculated BMI score. But experts do recognize the BMI as a general estimate of body fatness for the average person and a good screening tool. If you've just started thinking about weight loss, it helps to know your BMI. BMI provides a fairly reliable indicator of body fatness for most people and is used to screen for weight categories that may lead to health problems. The two BMI categories associated with higher health risk are "Overweight" and "Obese". If your BMI falls in one of these categories, you may be at increased risk for cognitive problems and other diseases. Consider whether your calculated BMI seems to accurately reflect your situation. If it does, try to lose enough weight to get your BMI out of the "overweight" or "obese" category and down into the healthy "Normal" range. Now you've got another motivation to lose weight: the health of your brain. If you are overweight or obese, lower your risk of memory loss or other cognitive problems by getting your weight under control. Eat more fruits and vegetables and fewer foods that are high in fat and sugar. Drink more water [or tea] instead of sugar drinks. Everyone, including adults of all ages and ability levels and children, needs to get the recommended amount of physical activity. Parents can listen to their pediatricians and restrict television viewing for their young children to less than 2 hours a day. Avoid putting televisions in your children's bedrooms. Beyond these recommendations there are many diet and exercise programs available from different sources. Try to find a weight-loss approach you can stick to and that makes the most sense for your situation. Note: Always consult an appropriate medical professional before changing your diet or starting an exercise program. Your doctor can point out areas of concern based on your medical history to give you the best chance of success. 1. "Neurological Researchers Find Fat May Be Linked to Memory Loss." Press Release: Rush University Medical Center, 8 October 2013. 2. "Overeating May Double Risk of Memory Loss." Press Release: Study presented at the American Academy of Neurology's 64th Annual Meeting in New Orleans, April 2012. 3. "Body mass index over the adult life course and cognition in late midlife: the Whitehall II Cohort Study." American Journal of Clinical Nutrition. 2009 Feb;89(2):601-7. doi: 10.3945/ajcn.2008.26482. Epub 2008 Dec 10. 4. "Rise in Weight Linked to Cognitive Decline in Older Adults." National Geographic News. 13 November 2014. 5. The Gerontological Society of America. "Overweight middle-aged adults at greater risk for cognitive decline in later life." ScienceDaily. ScienceDaily, 24 February 2010. www.sciencedaily.com/releases/2010/02/100223154344.htm. They found that obese people had 8 percent less brain tissue than normal-weight people, while overweight people had 4 percent less tissue. According to Thompson, who is also a member of UCLA's Laboratory of Neuro Imaging, this is the first time anyone has established a link between being overweight and having what he describes as "severe brain degeneration." "The brains of obese people looked 16 years older than the brains of those who were lean, and in overweight people looked eight years older," says Thompson. It seems that along with increased risk for health problems such as type 2 diabetes and heart disease, obesity is bad for your brain: we have linked it to shrinkage of brain areas that are also targeted by Alzheimer's," said Pittsburgh's Raji. But that could mean exercising, eating right and keeping weight under control can maintain brain health with aging and potentially lower the risk for Alzheimer's and other dementias." 7. "Lower Working Memory Performance in Overweight and Obese Adolescents Is Mediated by White Matter Microstructure." Journal of Internal Neuropsychol Soc. 2015 Dec 28:1-12. Study conclusion: "These findings indicate that higher BMI is associated with decreased FA in WM fibers connecting brain regions that support working memory, and that WM microstructural deficits may underlie inferior working memory performance in youth with higher BMI." "Obesity affects a number of physiological mechanisms that can have an adverse effect on the brain," says John Gunstad, of Kent State University, one of the authors of the study. The study adds to a growing body of evidence suggesting that obesity is linked to other cognitive deficits as well. It is a known risk factor for Alzheimer's disease, dementia, and stroke. Gunsted also said, "Hypertension, Type 2 diabetes, sleep apnea, all of which are consequences of being overweight, are all bad for the brain too."